News continues to emerge about microgrids and energy storage being employed during and after the recent North American hurricanes, most recently in the Dominican Republic. When the storm season was threatening, the Dominican grid operator asked power services company AES Dominicana to keep two 10-MW of energy storage units operating to ensure grid reliability. The energy storage arrays performed more than double the normal amount of work during Irma and Maria, category 3 and 4 hurricanes, according to AES. Even as nearly 40 and 55 percent of the island’s power plants were forced offline, the energy storage units helped keep the Dominican grid operating. Used instead of the thermal power plants to maintain frequency, the energy storage system provides fast-response, critical reliability services that would otherwise be performed by a traditional thermal power plant three times the size. By adding energy storage to existing thermal power plants to maintain frequency, the Dominican grid operator can enable the power plants on the island to run at their most efficient generating level while the battery systems absorb and discharge energy on the grid as needed. Separately, such companies as Tesla, sonnen and others are delivering microgrids, solar panels and batteries to bring post-storm relief to hard-hit Puerto Rico. Puerto Rico’s Governor Ricardo Rosselló and Tesla CEO Elon Musk have been collaborating on bolstering Puerto Rico’s grid with batteries, solar panels and microgrids, after Hurricane Maria left most of the island without power on September 20. As of Monday, October 16, 86 percent of Puerto Rico remained without grid power. Meanwhile, German manufacturer sonnen announced earlier this month that it is launching an effort to bring microgrids to Puerto Rico. Together with island partner Pura Energia, sonnen will focus on areas where a stable microgrid will make a significant impact on a local community. sonnen said it will subsidize the cost of Pura Energia installing the battery units and the solar array microgrid components. The partnership hopes to bring its first operating microgrid to Puerto Rico in less than a month. Several other microgrid, solar and battery companies have reported plans to help out the island, including distributed wind energy providers. Is a Network of Minigrids the Answer for Puerto Rico? A new energy-as-a-service (EaaS) model has emerged that simplifies microgrid development and ownership for organizations. EaaS relieves the microgrid host from operational and financial risk—but guarantees them the benefits. 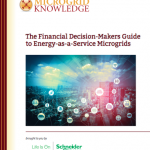 A new special report from Microgrid Knowledge and Schneider Electric explores in detail the new model for energy-as-a-service microgrids.